This was the remnant of something called "Road Profiles", which...is explained below. Originally "Road Profiles: Houston Street". It is currently under construction once more. Welcome to Roads Profiles! This is the result of a brainstorming session I had, this takes a look at the individual roads of the area, returning some of the focus back to the original site name. Links to other articles at this site are in bold. This is subject to be edited, too, as I get more information. I plan to make (or to retrofit) more of these to showcase smaller things and link to other articles. Don't worry, "real" articles are most certainly not dead. There have been proposals to route Welsh down to Houston, but ultimately has fallen through due to neighborhood opposition. This was finally more or less confirmed in the late 2000s when the narrow section of Welsh north of Holleman was torn up and replaced with a narrow concrete road. Houston Street's rerouting has changed several times. I could look it up at "Historic Aggieland", but it was down during the holidays, so I'll have to get caught up later. The earliest known route is in 1919 where it follows pretty much the same route as today, though with the missing parts filled in, a bit straighter near where Lechner is, and terminating at the south end of modern-day Koldus. Later on, it went through a slightly different route, curving into Fairview, before finally terminating at the intersection of Jersey (later George Bush) as it does today. By the time this happened, however, the MSC had expanded and the road was no longer in one segment. Anyway, I always knew it as being in three parts: the south, the central, and the north. The south section is a concrete two lane road with bike lanes, with a stoplight at George Bush installed in 1995. The expansion of the Memorial Student Center and the building of Rudder Tower in the early 1970s sealed off the connection between the center portion and the southern part of Houston Street. On the other side of Houston (which Lamar Street curves into), it's northbound only, and the striping is completely screwed up. Here's what I mean: in places, like, say Jones Street, it was once a narrow two-way road, but was modified into one way with bike lanes heading each direction. But on Houston Street, that's not the case: it's much narrower heading the opposite direction (with the yellow stripe) and a bit wider on the bike lane, and a wide single lane. The result is that buses often stop on the right to pick up and drop off, which means certain risk if you happen to be biking that way. The sensible thing would be is that since there are sidewalks, eliminate biking on the streets altogether, and change the lane closest to the east (with the stops) as a double-white-line buses-only lane and the other for vehicular traffic. The YMCA Building I have yet to write anything on, but you can at least see some pictures here. Other buildings include the Richard Coke Building and the Beutel Health Center. At All Faiths Chapel, the road curves into Jones and continues back south, but circa 2005, however, the connection to north campus finally reopened between the center and north portion after years of being for pedestrian use, but it was buses only (even on nights and weekends). The entrance to the Underground and Einstein Bros. are off of Houston, too. 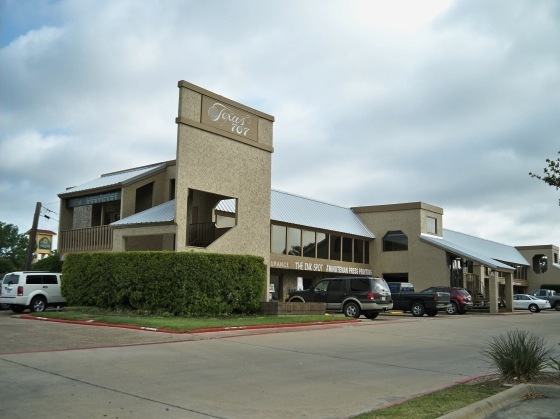 Lot 32 is also here, it used to connect to the Special Services Building, and itself used to have the original "Aggieland Inn" from 1925 to 1966. Unrelated to the former Ramada, it was essentially a hotel for others to stay on campus without actually living there. It was doomed by the MSC (a much nicer on-campus hotel) and later the first Ramada Inn. It was torn down shortly after the Ramada opened off-campus. Recently, though, I noticed that Lot 32 has been torn up, probably for conversion into a concrete road (and/or access to the new dorm). Originally, Houston split into two concrete shady separate lanes (but without bike lanes) and up to the stoplight at College Main and University, but in mid-2012, as part of a rehabbing of University Drive, the northbound lane past Sbisa was cut off and the southbound lane of Houston could only be accessed from University. The remainder was turned into bikes only. 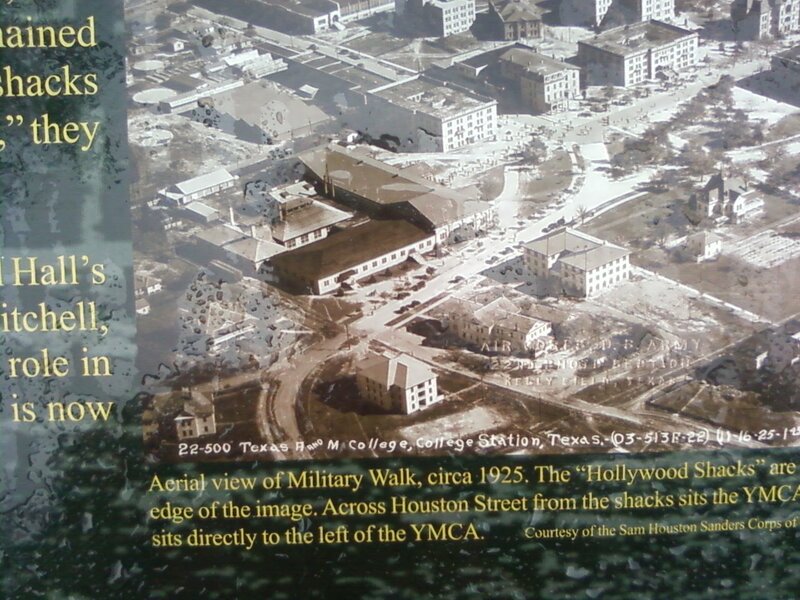 YMCA Building - Renovated many, many times in the last century. 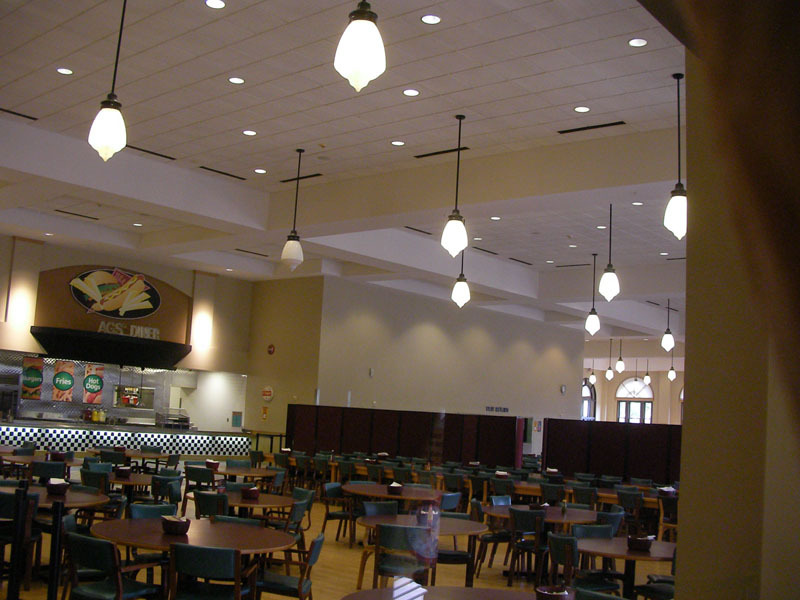 Sbisa Dining Hall - Sbisa's address is actually Houston, even though it faces Ross. The entrance to Einstein Bros. Bagels and the Underground face Houston. 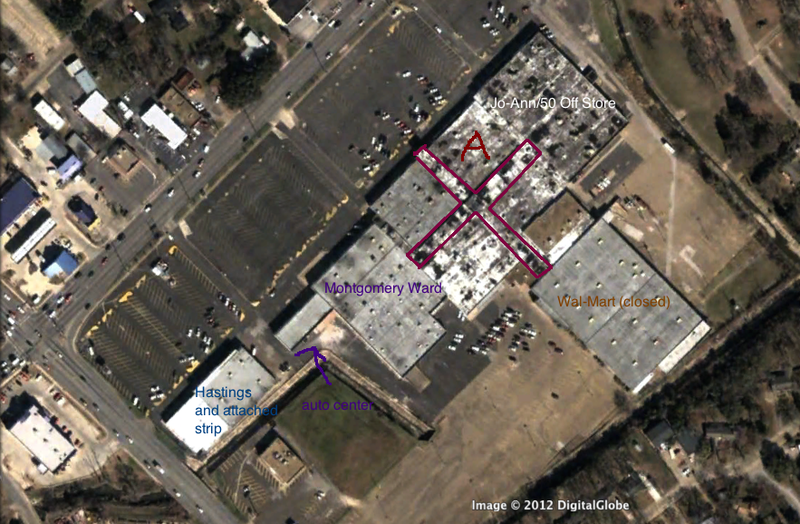 Back when I discussed Parkway Square, home of the original College Station Kroger before its closure in 2016, I had some speculation (on at least the older version of the page) if there was a true "Kroger Family Center" at the spot, if it was ever there. 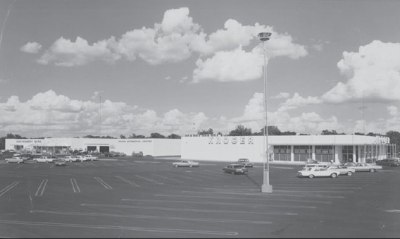 the early attempt for Kroger to make a true "supercenter" with a full line of products including apparel and sporting goods. Well, while the College Station one was not a Family Center, the Bryan one was. While Kroger had swept off the general merchandise from most stores, the Bryan one was not. 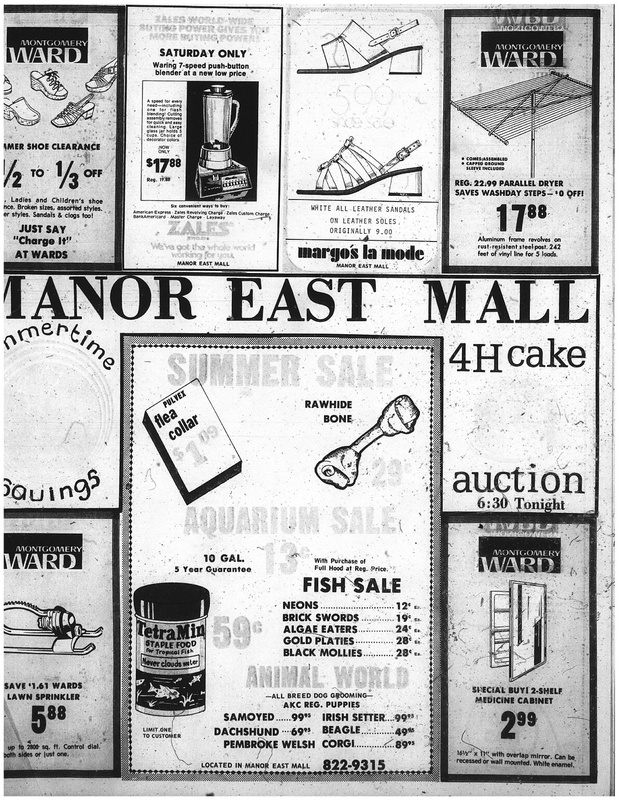 In a move from the Manor East store, the Kroger Family Center in Bryan opened in 1977 with a wider selection of merchandise. Well, as it turned out, it actually was a real Family Center until sometime in the mid-1980s when it remodeled into a Food & Drug retrofitted "Greenhouse" style store, with a facade resembling the classic facade. 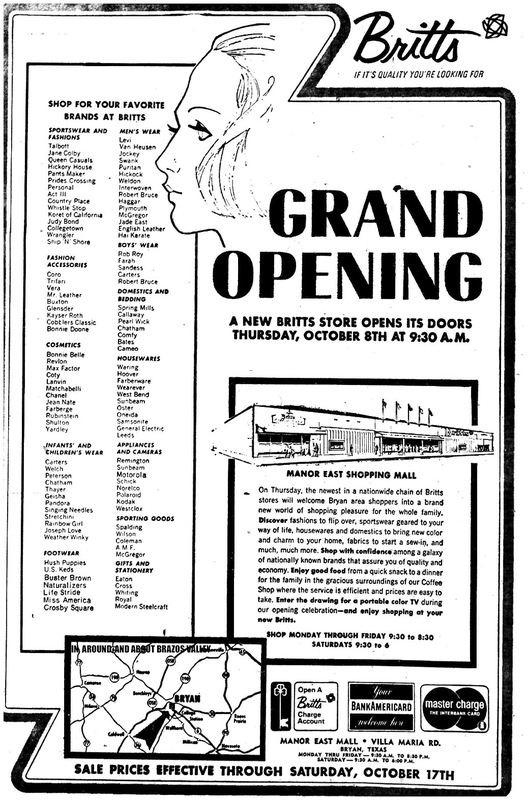 I'm not sure when it renovated, in October 1985 it was still selling the full line (like ammunition), long after Kroger had pulled the plug on many other stores that weren't in its market areas (like Victoria, TX). A mezzanine level sold clothing, too. The strangest fact is that there appears to be a significant gap between the closure of this store and the opening of the next. Usually when a store moves, either both remain open (briefly), it can open next day, or a total closure for two weeks. But from the way it looks, it looks like it was closed for about three months. The new Kroger opened in April 2006 but no mention was of the older store, because when the news came when the short-lived Bryan Albertsons closed, it was mentioned that the Kroger had closed in late 2005. 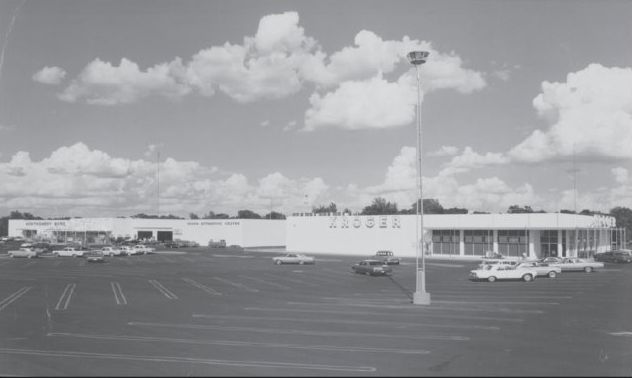 Combined with the fact that the new Kroger isn't meant to really appeal to the same crowd as the Kroger it replaced, it suggests that the Kroger was a loser store but Kroger still wanted to stay in the area. A few years after the store closed, it was renovated into "Bryan Square Shopping Center". The "fake greenhouse" was retained for the 99 Cents Only Store but the rest of the facade was remodeled. Other stores added in front of the store were Citi Trends and the Dollar Floor Store. There were also stores to the south side of the store, these were not renovated and allow you to see the original facade. Formerly known as "Kroger: All In the Family Center" before I changed it in May 2013. Updated four years later. This post was one of the last posts to receive a big update (October 2014) so a lot of this information is current and I didn't need to do much when I did some minor updates in May 2015. Note that as I'm no longer a student, this information will go out of date, so I'll need your help (comments) to update this. This post is on Sbisa Dining Hall (and if we go by the pronunciation of Sbisa's name, it's "spee-za", not "sa-beeza" as is commonly used. 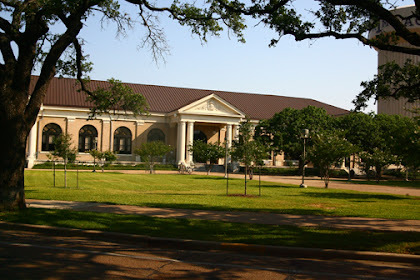 After the fire at the Mess Hall, at some point long before any current attending Aggie or faculty was born, a decision was made to not rebuild on the site and build an entirely new dining hall a block away. Sbisa in years past. The Corps crowd is replaced by the Northside dorm crowd, which is completely different. Sbisa Dining Hall is located at the corner of Ross and Houston, where the current building has been there for nearly a century. Named after Austrian-born chef Bernard Sbisa (the head chef of A&M), it was built in the classic European style that dominated campus in those days (regrettably most of those have been demolished). I don't have pictures of the old Sbisa Hall (though its incarnation in the 1940s can be seen in the film We've Never Been Licked), and I did manage to snap this picture in Military Walk, showing a much smaller Sbisa and a railroad spur from the Ross end, roughly where the "back entrance" (near the C-store) of the Underground is. It should be noted that Sbisa wasn't named Sbisa originally until well after Sbisa's death: he died in 1928 (shortly after the dining hall completed a physical expansion in 1925, which was known as Sbisa Annex for a long time) but it was still called the Mess Hall for a few decades afterward (or do I have my references wrong?). Because there are so many facets of Sbisa I want to focus on, this post is broken up into multiple parts. In 1954, Sbisa was renovated (and not for the last time), adding new lighting, new décor, and air conditioning for the first time. It was likely at this time that the plumbing and electrical work was overhauled (also not for the last time). At the time, meals at Sbisa were still served family-style. 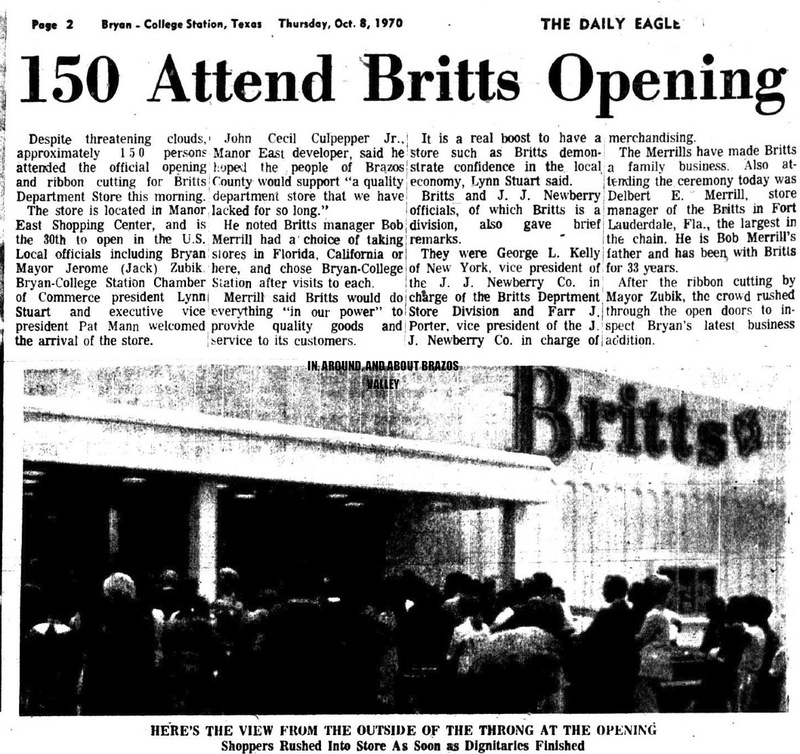 A further detail is elaborated in Aggieland '74 in which it stated that the dining rooms had different purposes, for breakfast, one served a full breakfast, the other was a continental breakfast (which included doughnuts, though I'm guessing they were cake donuts). Similarly, the lunch line featured a hot lunch while the other offered soup and sandwiches. Sure, it all sounds pretty reasonable, but Sbisa and Duncan were still the "main places" to eat meals (the four "Snack Bars" and Rumours were coming in at this time). It's also possible that the "third dining room" was in the lower level, which would eventually be the Underground. In 1975, Sbisa went through another renovation, which would be for the next two and a half decade. The new 1975 Sbisa (completed in 1976) introduced a few innovations to Sbisa that would still carry over to modern times, including a wheelchair ramp and a conveyor belt system to send trays back in for washing. The renovation removed walls from the dining rooms, with two dining areas (one reference said three, however), one of which served fast food (pizza, soups/sandwiches, hamburgers). The ceiling level was dropped as well. The article I derived this from (courtesy John Ellisor) has one of the first mentions of the "Peniston Cafeteria", which would be the Underground many years later. Unfortunately, mention of that is rare since punching that in on TexAgs would censor it (the Scunthorpe problem in action). Jay Peniston was the TAMU dining supervisor in the 1940s and 1950s, and oversaw the 1950s renovation of Sbisa and Duncan. By the late 1990s, the HVAC system (some of which hadn't been changed since the 1950s system under Peniston), sewer system, and décor were out of date, and Sbisa closed in December 1999 to perform major renovations on sewer and HVAC work. During closure, there was an option to get food, a temporary area that's gone by both "Fish Pond Outbound" and "Sbisa Hut". 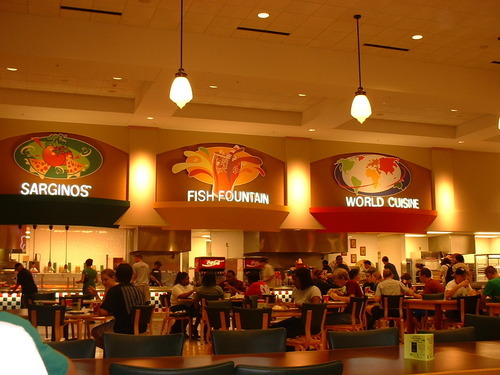 When it reopened in fall 2000, it featured two "areas" to get food with seating between them. There was the "Market", which offers a few salad bars, an omelet place, and a few cafeteria style lines (usually with freshly carved meats). The other side of "new" Sbisa featured several mini-lines clustered around the seating area (which was the reincarnation of the "fast foods" portion and the creation of a new main dining room), the first known "Sargino's" on campus (did you know it's a pun on "Sergeant"? ), which was later renamed "Pizza & Pasta Station", probably because the P&PS pizza was the worst pizza on campus (maybe not so much with the service provider change--everything might taste the same now. While this negatively affected the pizzerias in the Commons and Ag Cafe, Sbisa's may have benefitted). "Dessert Center" (formerly "Sweet Traditions") had things like both fruit and Blue Bell ice cream. "Fish Fountain" was the drink center but renamed later for obvious reasons. The only things that still carried their original names up before Compass performed a cheap redecoration: "Ag's Diner" (hot dogs, hamburgers) and "World Cuisine" (Mexican or Oriental). There was also a soup station, and at one time a cook-your-own station...although there was still a waffle maker, I think the CYO had long been replaced with gluten free options. Some parts were served buffet style, some parts were cafeteria style. I've pulled up a few pictures (via Google search) that show Sbisa after renovation, but none before. Also note the tables: they're not like that anymore, by early 2012 it was mostly cafeteria-style tables, which flip-flopped in later years (the cafeteria tables disappeared again after Chartwells took over). In September 2012, I returned to Sbisa to find it oddly changed. All signage was gone: the neon "Market" sign, all the graphics and lettering gone, the price board, even the "no taking food out" signage. The food quality was altered due to Compass (no more "TruMoo" chocolate milk, though the nickname "Sa-grease-a" was less of an issue) as well. Also removed were the long, cafeteria tables, returning to individual tables. This disappointed the dorm groups, who would sit at those tables. A few months later, the signage was back, but only generic red Helvetica lettering (as slightly different food lines). What the heck was Compass thinking? This was a time of much anger, as the food/price quality was worst and due to a maligned meal plan, people were forced to stand in long lines at peak hours, routinely stretching outside. One planned change of having an entrance at Houston Avenue never happened. In summer, Sbisa was totally gutted again, losing the circa 2000 layout and the joke of a redecoration put there a year or so prior. The new layout would alter the lines. Rather than the two "areas", there was one common food dining area with several kiosks to get food. 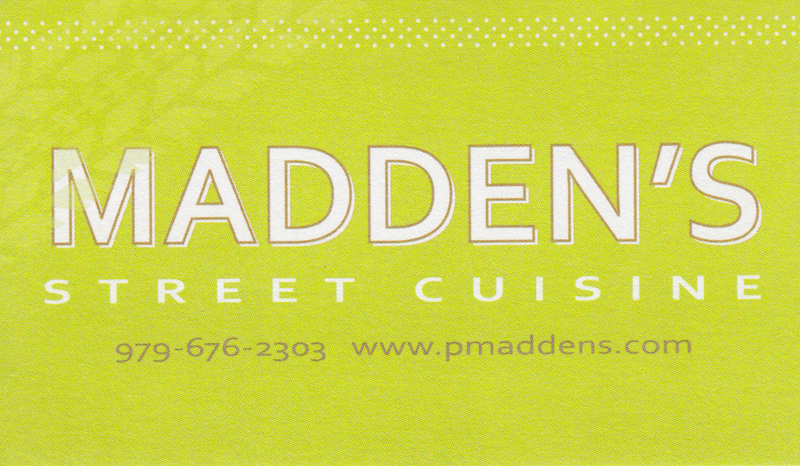 Part of the reconfiguration involved some new eateries accessible from Houston Street. These included Lime Fresh Mexican Grill, which is actually not a concept from Compass (as I was previously told, or at least led to believe), and actually has locations mostly in Florida (and a few in Chile, even) and Smashburger. Smashburger is an actual chain. More on these are described later in the post. Through the doors of Sbisa. Note the long lines. Taken near the entrance of Lime. The dining hall originally went well past this mark, but this is an emergency exit now. Patrons of Lime/Smashburger and Sbisa can see each other, but you can't actually go through this door. One of the new features of Sbisa (which I actually got to eat in ultimately, and the food was decent, but sadly Compass lacked the great dessert options the original Sbisa had) was a second level accessed via a slightly curving staircase. Since the renovation only took place over the course of the summer, I'm sure they re-used a lot of the 2000 infrastructure which was still up to code, but I'm still not sure on the added second level loft. Is the century-old building really that sturdy, or did the extensive 2000 renovation make that theoretically possible? As seen above, we have the current tenants, Einstein Brothers, Smashburger, Lime, and the underground. As mentioned before, Lime and Smashburger were created in the 2014 renovation. Up until its closure in January 2013 (a previous version of this page reported 2012, that's wrong, I apologize, it was a typo), Bernie's Place opened at sometime in the 1990s (or even the late 1980s, or whenever the new metal roof was added). 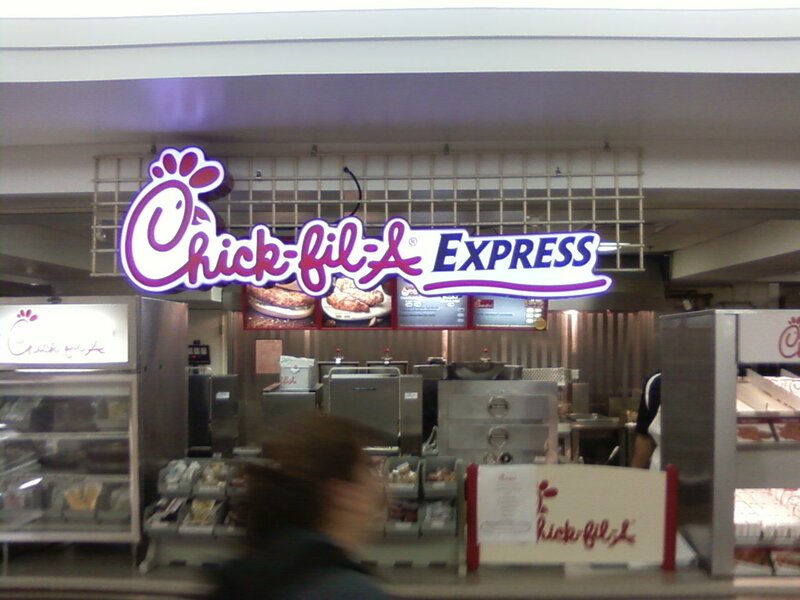 It featured pizza and pizza rolls (really good pizza rolls, apparently) in the early 2000s, but by the end of the decade, it primarily offered sandwiches and wraps, changing names over time, becoming "Bernie's Café Espress-O" after the Sbisa renovations circa '99-'00, and then eventually Bernie's Café. One day, it was spotted on the Restaurant Report Card that Einstein Bros. Bagels was listed in Sbisa's address, which, although it would be preferable if we got a real one (i.e. : off-campus), turned out to be not going in the Underground where bbqs was, but where Bernie's was, marking the death of the former pizza emporium. Einstein Brothers opened in February 2013. Before mention of Bernie's disappeared from A&M's dining website, I grabbed a copy of the Bernie's menu. As for Smashburger and Lime, they are accessed through a new interior corridor with a restroom and a window into Sbisa (it's emergency exit only). I was looking forward to Smashburger because the menu actually included beer, but apparently so did Lime (why can't I have a cerveza with my tacos? ), and obviously neither did Smashburger. I'm not sure why it's gone, especially since as stated in the MSC article, beer was supposedly considered but removed because of the MSC's memorial status, and it's very very close to Northgate, which does have beer. 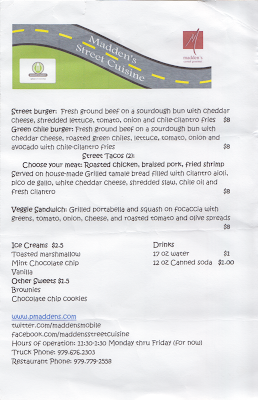 Lime Fresh Mexican Grill is good, and I was the very first customer there (got my picture taken, but it's not posted). It's not cheap but it is very good, enough for me to get my "I want Taco Bell style tacos but not actually Taco Bell" tacos. Smashburger is alright as far as burgers go. It's got soft egg buns like Harvey Washbanger's (at least I think they're egg buns), fries are lackluster, and it will do in a "I've got a feeling for burgers" pinch. The Underground was opened sometime in the 1970s as a straight cafeteria that served "the same stuff as Sbisa" (that would be Peniston Cafeteria, of course--now you can see why that's not found on TexAgs), but it wasn't called the Underground at that point, however, by the late 1980s, even though it didn't have Chick-fil-A or anything at that point, it was called the "Sbisa Underground Deli", although in 1988 it was known as (get this) "Underground Railroad". Whether you think is offensive, silly, or maybe a bit of both, it was scrapped after not too long. I found this ad in a 1988 Football Program. Betcha you didn't hear that on TexAgs, either. The Underground opened in its current form circa 1993 or 1994 in its current phase: there were actually surveys done (back when surveys were done through students and not email spam) about what students would like to see in the Underground. It was quite an opportunity to get fast food on the meal plan, which was a huge deal at first to many students (Chick-fil-a and Whataburger on the meal plan was nothing to laugh at). One of the original tenants was a Taco Bueno (a limited-menu walk-up one--and not a Taco Bell, which some accounts have), which sadly closed in 1999, the roster since 2001 has had Whataburger, Chick-fil-A, Se Wrappé (A&M concept), Alonti Deli (apparently a chain? ), and Colombo yogurt. One source as to when the "new" Underground opened is the official CFA website, which claims it first opened February 20, 1995. Another sign of when it opened was the fact that Whataburger closed after the fall 2004 semester after its lease lapsed and they didn't want to renew it. The number of students on meal plans this year at Texas A&M Univ. in College Station has jumped 5%-6%, says dir. Ron Beard, who expects it to rise more when a new dining center opens in the spring. "Most of the increase is due to the huge flexibility offered through our Outbound program," he says. 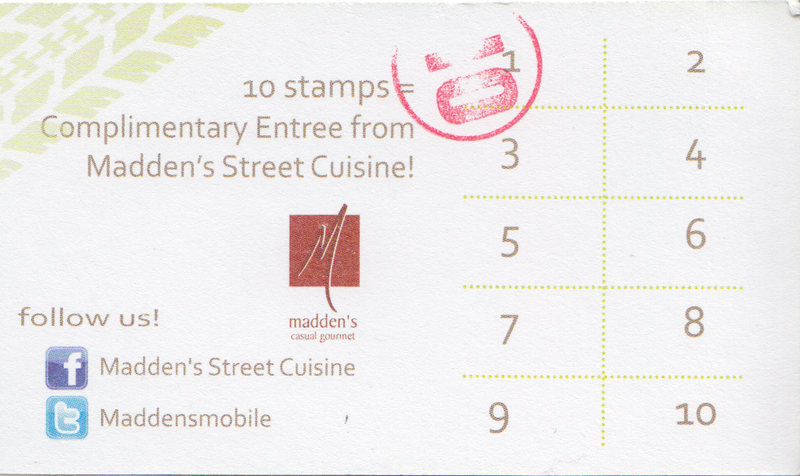 The program began in Jan. 1998 to offer take-out meals from board-operations. In fall 1999, it was expanded to two cash-operations "and was a smashing success overnight." Fully rolled-out: When Sbisa, the campus' largest dining hall, closed a year ago, the program was further developed to all cash operations in order to continue providing students with a wide variety of food. Outbound offerings vary from location to location, but in each, six to eight choices are available. These range from pasta with sauce, salad, garlic bread, medium fountain drink and a dessert such as cookies or fruit, to a breakfast croissant or sandwich with fresh fruit and a drink such as juice, milk or Starbucks coffee. The latest renovation being undertaken at the 43,000-enrollment university is at Sbisa Dining Hall, which was built in 1911-12. "This will be the Taj Mahal of f/s in the U.S.," says Beard (see Oct. 15, 2000, FSD, p. 42). The lower level also houses a smoothie bar and a remodeled c-store. "We cut it in half to add 50 more seats for the foodcourt," says Beard, who says he feeds 2,500 students in daily in this unit alone. "We'll offer the same variety, but will just stack foods higher and restock more often. The c-store is still pretty big (approx. 1,200 sq. ft.) so I don't expect this to hurt us at all." Over time, the yogurt place added smoothies (renaming to "Ultimate Fruit Sensations") and by the end of the decade, coffee (renaming to "Degrees"), at some point Alonti Deli became Pickles Deli, and Se Wrappé was stripped out for a barbecue place (01 Old Armydillo's like the old MSC place, renamed to bbqs sometime after 2008). Sadly, the Whataburger in the Underground would depart by the end of 2004, with the eatery "temporarily" replaced by The Other Burger. Over seven years later, The Other Burger was "temporarily" still there. There's also a convenience store in the basement. Despite what the article says, it seems cramped, small, and dirty and was last branded as a Rattler's, but in August 2012, it became "Outtakes", a house brand owned by Compass. However, Rattler's soon "re-took" the convenience store, including a short but awkward time when the convenience stores didn't accept Dining Dollars. Other changes in the Underground about that time was that Degrees closed and was replaced by a Smoothie King. I never liked Smoothie King, having used a coupon at Parkway Square years ago. Still, I appreciate it in spirit, as it as another branded option. Pickles Deli was now Mondo Subs (having now turned into a plain, generic sub sandwich place), The Other Burger was now The 3rd Degree (with a substantially reduced menu and quality, not that TOB was top-notch), and Chick-fil-A is still there. 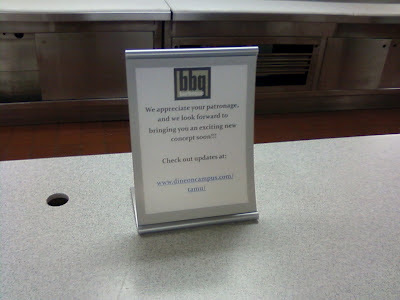 bbqs was gone, however--sad, but almost makes sense: it was designed to replace 01 Old Armydillo's, but since barbecue has returned to the MSC (as "Smokin'"), it rendered bbqs obsolete. After some hectic times where none of the places (save for Smoothie King) were open after lunch hours to my dismay, in fall 2013 a few new changes shook up the Underground. I do have some pictures of the Underground I took a few years back soon after the Compass takeover. 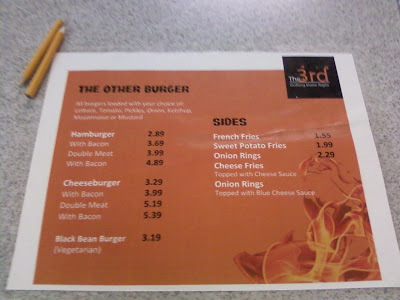 Note that 3rd Degree still pays homage to its predecessor eatery. One of the reasons I despised Compass was because I despised Mondo Subs. While at the Pickles Deli locations, a chicken caesar wrap was pretty good, Mondo Subs managed to screw it up in every single way. The chicken was flavorless, the lettuce was white, the tortilla was old, the caesar dressing tasted awful, and the parmesan cheese had the look and feel of toenail clippings. I should never have to describe food with the phrase "toenail clippings". For a while, the bbqs vacancy was rumored to be a Denny's Fresh Express but that never happened. The bbqs vacancy was filled with 3rd Degree while the old Whataburger location became Papa John's, which I was excited about, but instead of having boxes of pizza, they're offering 8" personal pizzas (three flavors and not even Supreme), and didn't even taste really like Papa John's, they just ran them through a conveyer-belt style cooking thing and I think the pizzas were undercooked (there was a narrow window when they were cool enough to eat but just within an hour it became inedible). The lines also became really long during the Compass mandatory meal plans days, which is why I ended up stopped going to the Underground altogether. In fall 2014, as part of the Sbisa renovations, the Underground was renovated again. The new renovation opened it up a lot more and gave the brands larger and more attractive storefronts. There was still Smoothie King, of course, but while it did change it to pay-at-the-counter (like a traditional mall food court), which eliminated the walls, but reduced the food court's store count. The old Chick-fil-a front became a large wall with a Chick-fil-A Express logo (and I was told that the CFA would become full line), the Papa John's now faced toward the entrance, previously, that used to be the pick-up line for the burgers (which was walled up when The Other Burger closed), a new place called "Houston St. Subs", which was a Compass/Chartwells brand. 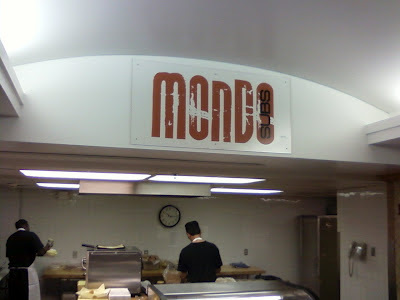 I never ate at Houston Street Subs because I had little reason to believe it isn't a repackaged "Mondo Subs", the aforementioned "toenail clippings wrap" place mentioned before. It also lacks a fifth option, which eliminates burgers (Smashburger is above), but it lacks a fifth option, which could've been that Denny's Fresh Express discussed but never realized. The bathrooms pre-renovation were terrible, there was a urinal, toilet with door, and sink, but this was cramped and likely not ADA compliant, so that was altered to get rid of the walls and just make it single-use. Going around to the back, the convenience store is still the same (untouched, really, including the same old floor tiles), but it also lost the Rattler's again (though having lost and re-gained it, I wouldn't put it past Rattler's to re-take the convenience store, though as of early 2015 this has yet to happen. The Rattler's at Hullabaloo Hall and the Commons were also genericized. Sbisa mostly serves the Northside dorms, with the once-common "'Bisa Ball" fights (mostly constructed of the napkins) among the Northside dorms, which have fierce rivalries (subcultures, gotta love 'em). I never really liked Sbisa's main dining hall anyway: mostly because of aforementioned buffet food, and I felt like what I was eating was both bad and bad for me. That and the folding chairs near the dessert area/pizza area were awful. Coupled with the rising prices and the general creepiness of the place (that's Northside for you) caused me to avoid the main Sbisa Dining Hall. Of course, with the numerous changes to Sbisa, Old Army hates it, but that's to be expected, right? 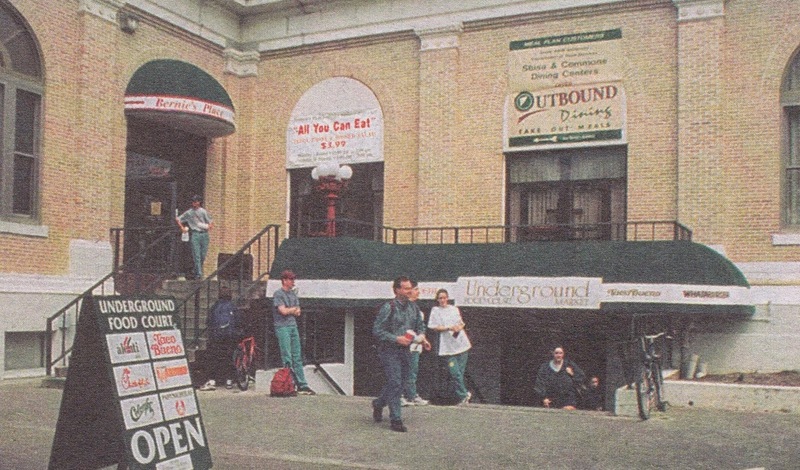 Here's a photo from c. 2001 (official marketing shot) of the once-generic "Underground Market". More recently (spring 2014), however, I managed to get a picture of when something on the awning changed, revealing the original brand. It did briefly go back to Rattler's again, then "The Aggie Express" or something when it lost the branding again. I hope that Rattler's can get it back, or some other convenience store brand. Not all of Sbisa is used for eating. There's an entrance on the southeast side (to the right of the main entrance) but I'm not so clear on the history of it (as of 2014, it's the "Global Supply Chain Laboratory", but in Spring 2012 was offices for something nuclear-related, if I recall correctly). For more places to eat on campus, both current and former, check out Aggie Food, or see specific pages, like the MSC article or what we have on The Commons. Right, so avid readers may notice I put back up the Plaza Hotel article, this time showing more of the other buildings on the block. The reason, of course, being we have a -new- article that has that for context. 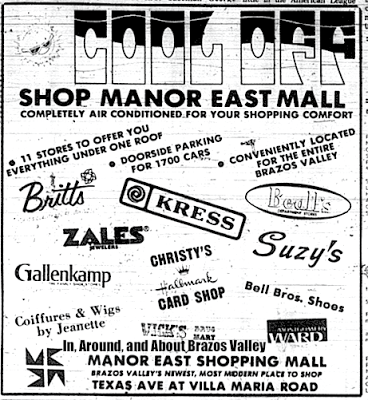 It's the circa 1972 "Texas 707", formerly the "707 Shopping Village". Seems during that time, it had unique specialty stores in a time when the local economy was flourishing. Today, it's mostly service tenants (like Tutor John and a few travel agencies). 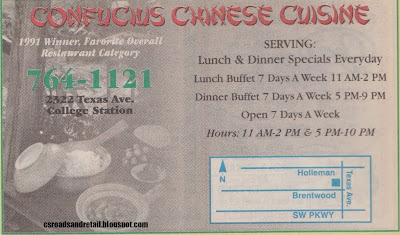 Even into the 1990s, there was Charli (moved to University Drive) and Hunan (an excellent Chinese buffet by all accounts). According to commenter AggiePhil, who derived his information from the Brazos CAD database, "Originally built in 1972, 707 Texas Avenue today consists of seven buildings across three phases or sections: A (one building, nearest Texas Ave.), D (one building), and E (five smaller buildings). I can only assume that phases B and C existed but were torn down at some point. Phase B was probably Phase A's twin, torn down in 1996/1997 to make room for On The Border." The last part has been backed up by a 1997 article that describes how On the Border and Lone Star Pavilion (the shopping center with Office Depot, Barnes & Noble, and Best Buy). The older picture is from Project HOLD (note the Gulf station and Ramada Inn in the background). The newer picture is from Loopnet. There are more modern pictures below, taken in May 2014 (except for that article). Charli was in either B or C, but it appeared to have its own building. You can see both the Charli building and the "twin" building mentioned here. And, like the article backs up, Charli was torn down for more parking while the other building (B?) was the main one that was torn down for On the Border. I took a stroll down one of the "hallways" in the back building (E), it actually is well-maintained, and a bit of a shame it isn't better utilized. It was probably lined with interesting funky local stores at one time. I didn't too thoroughly explore Building D.
Building E leads into the "mall" area, and of course Building A is the one that looks out toward the street. It may look slightly different than the first shot since I remember a storm ripping off one of the exterior walls. Other tenants of Texas 707 historically include Petal Patch, which according to an early 1970s phone book was "Petal Pushers", interestingly enough. Additionally, a 1996 directory lists these other services, besides aforementioned Hunan and Charli: A R Photography [may have been "A&R"], Arthur J Roach PHD, Associated Printing & Graphics, Copy Boy, Doug Hunter's Enterprises, Hair Extraordinaire [this actually ended up moving to Culpepper Plaza II], Hunnybee, JMS Building Maintenance [no idea], Kaplan Test Prep [I'm pretty sure this is still here! ], Kirby Co. [vacuum cleaners], Let's Talk, Stress Dynamics Inc., and Travel Designers [travel agencies have tended to be a historic part of 707]. OK, if there are any comments, please leave them, I always appreciate it, and see you next time! Want to see more of the Texas Avenue stuff? 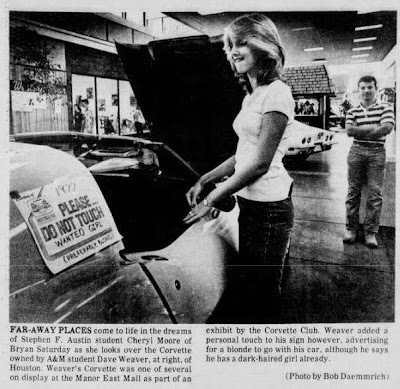 This post is a "mega-post" of sorts on Culpepper Plaza (later Central Station) which was opened in March 1976 with a Safeway and a full collection of other retail stores. In late 2006, the redevelopment began on the strip, which was looking pretty shabby (Weiner's, Eckerd, AppleTree, and other major stores had all left), and by 2007, parts of the strip were torn down, and assumed its current name at this time. 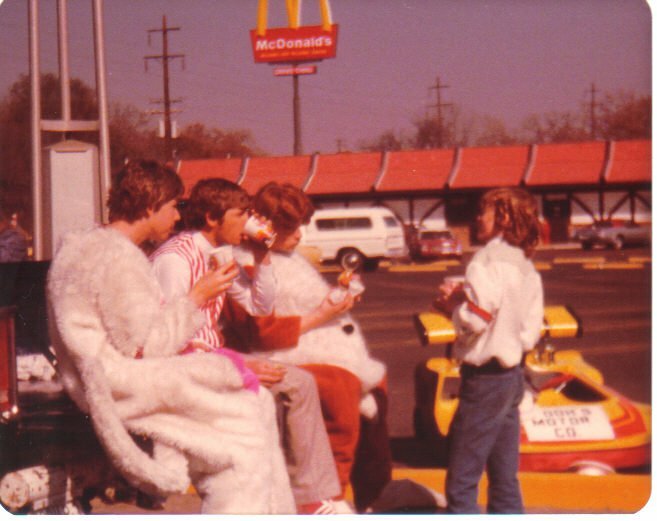 Burger King (one of the wood-trimmed-interior ones built in the early 1980s, 1719 Texas Avenue) would move out and be replaced by a new Chick-fil-A, the second Chick-fil-A in College Station (that is, if you didn't count the four CFAs at the time on campus--Ag Café, MSC, Underground, Commons--though they were all "Express" locations) and the first that wasn't part of a larger structure (Post Oak Mall, specifically), and also the second stand-alone CFA in the county. Specifically, Burger King would move and replace an old Diamond Shamrock (the classic old green-and-white design, with the helvetica lettering) at Deacon. To this day, that Burger King continues to be the only Burger King in town, while McDonald's has the area well saturated. The strip center was renamed "Central Station", though people rarely call it that (in favor of its original name or "Kohl's shopping center", which is increasingly becoming more common as Culpepper fades into memory). As one can see from the fire insurance map, however, there's a Hastings, Safeway, and a few other restaurants. In late 2006, the redevelopment began on the strip, which was looking pretty shabby (Weiner's, Eckerd, AppleTree, and other major stores had all left), and by 2007, parts of the strip were torn down. Burger King would move out and be replaced by a new Chick-fil-A, the second Chick-fil-A in College Station (that is, if you didn't count the four CFAs at the time on campus--Ag Café, MSC, Underground, Commons--though they were all "Express" locations) and the first that wasn't part of a larger structure (Post Oak Mall, specifically), and also the second stand-alone CFA in the county. Specifically, Burger King would move and replace an old Diamond Shamrock (the classic old green-and-white design, with the helvetica lettering) at Deacon. To this day, that Burger King continues to be the only Burger King in town, while McDonald's has the area well saturated. The strip center was renamed "Central Station", though people rarely call it that. 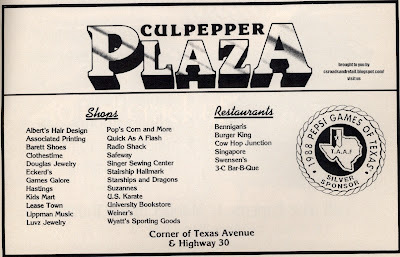 Over on Dominik Drive, there's Culpepper Plaza II (later Central Station 2, it didn't get a lot of renovations), which includes "Shop N Go Food Mart" (a convenience store), a tutoring place (college prep), and Centro American Restaurant & Pupuseria (opened 2012, one of my favorite restaurants). Past places included Poking You Tattoo (closed 2011? 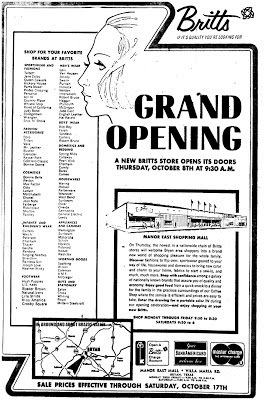 ), Shivers (second location--this added ice cream to the menu), Hair Extraordinaire, and BCS Bicycles (before they moved to University Square). 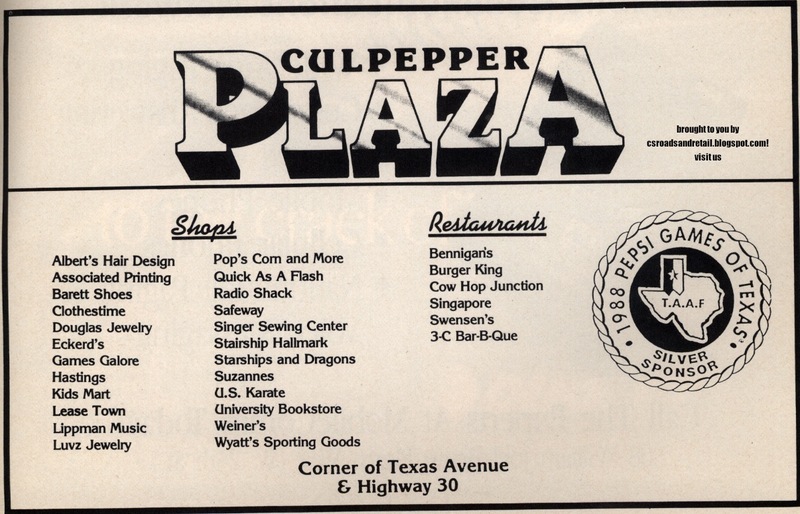 Today, Central Station is a thriving shopping center but Culpepper Plaza remains largely forgotten. The hotel and gas station nearby are not part of the center, and will be covered another time. We have an ad here. It lists Quick as a Flash, which is strange since not even the parking lot is connected. It shows some things I didn't know existed, including a popcorn shop (in the 1990s, there was a bagel shop), Starships & Dragons (comics and collectibles? ), and Singer Sewing Center. This must be (in 1988) just prior to Safeway selling out to AppleTree. Albert's Hair Design, Associated Printing, Barett Shoes, Clothestime, Douglas Jewelry (before moving out to Gateway? 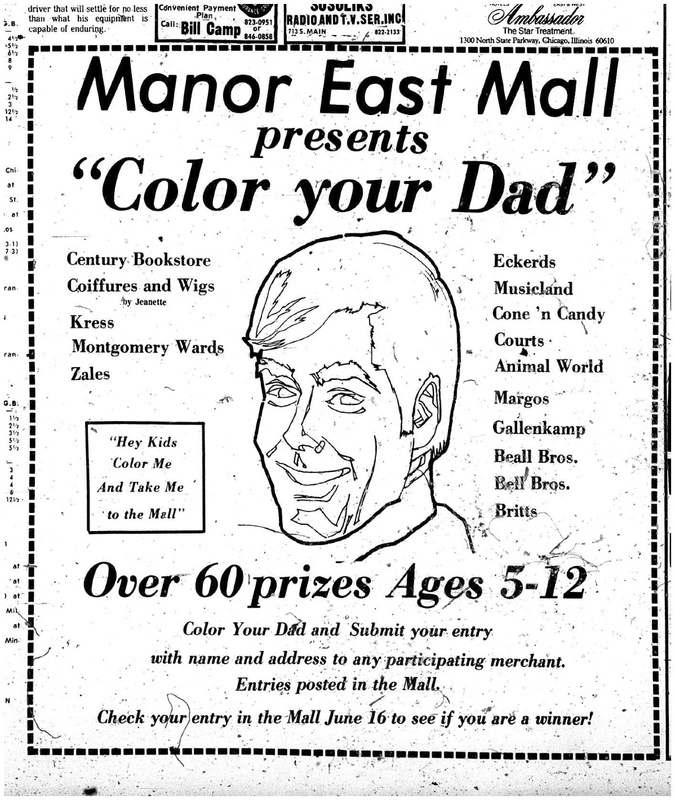 ), Lease Town (there was one at Manor East Mall in the late 1990s), Lippman Music (moved to Northgate), Luvz Jewelry, Pop's Corn & More (aforementioned popcorn shop), "Stairship" (sic) Hallmark, Suzannes, U.S. Karate, Wyatt's Sporting Goods, University Bookstore, Cow Hop Junction (a spin-off of the Northgate establishment), and a restaurant called "Singapore"...all haven't been mentioned here before. There's a better list below that I've created from directory listings and others, but it's far from complete--lots of stores and restaurants aren't even on here. 1505A - As far as back as at least the 1990s, this was the local Bennigan's restaurant. I never ate at Bennigan's, but it had an old mural (of the logo, nothing special) facing Texas Avenue. It survived the Central Station remodeling, but it closed in July 2008 when the parent company imploded. Later, it became an AT&T store, which it is today. This was one of the stores on the "smaller strip" and facing Texas Avenue. I've always wondered if the two restaurants were one tenant at one time. 1507 - Swensen's use to be here. One of my fondest memories is the inverted ice cream cone resembling a clown face. It lasted until around 2004. It was here when my parents discovered I could read signage at a young age. 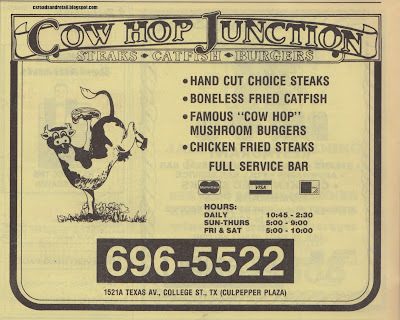 It was one of the earliest stores, existing as early as 1979 (it gets coverage in the 1979 TAMU yearbook, a two-page spread!). Eventually, it was filled by Firehouse Subs. 1509 - From summer 2009 to late summer 2014, this was the location of Spoons Yogurt (the FIRST Spoons in the chain). It looks like it was part of Swensen's originally (the space, that is). Supposedly, the reason it closed was a failure to renew the lease. That said, Spoons Yogurt's plans for expansion in later years never really took off--under the name "3 Spoons Yogurt", locations opened as far away as Clemson, SC, Lawrence, KS, and Knoxville, TN, but they all failed. Only the locations built in Texas (Huntsville, Waco) did well and remained open. After Spoons Yogurt closed, it was reopened as Galaxy Ice Cream & Bubble Tea (or Galaxy Tea House). Surprisingly, within a year, Galaxy was "sucked into a black hole" and Spoons Yogurt reopened in the space by late September 2015...and from the pictures I've seen of them on their Facebook page, it looks almost identical to how I remember it. 1511 - Current location of the UPS Store. I don't know what used to be here. In 1980 this was "Mother Nature Home of Nutrition"
1513 - It's likely the address was originally on the smaller strip, which some sources indicate as an address for Dollar Tree. Was it originally here before it moved into the larger strip? 1515 - In 1980 this was Godfather's Pizza. It was gone from here by 1989. I can't find any data on it in neither the '96 directory, the 1980s map, nor present-day searching...I believe it was absorbed into 1517. 1517 - This was "Luvz Jewelers" back in the mid-1990s (as for 1515, I can't find ). Luvz wasn't short-lived, it was around in 1988, as seen in the ad in this post. Muldoon's Coffee House opened in 2009 and closed at the start of the fall 2014 semester, the exact same timeframe as the also-missed Spoons. 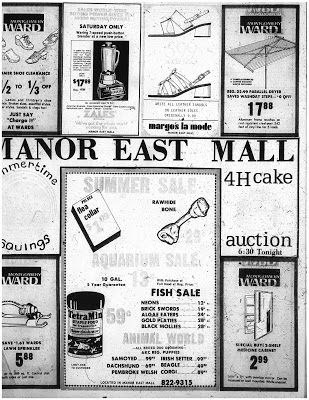 After Muldoon's closed, it became "Eyemart". 1519 - Supercuts. Has been here since at least '96 (if not longer). 1521 - When I was a kid, this was Pancho's Mexican Buffet. Featuring a little guy in a sombrero, Pancho's was a Mexican buffet restaurant. While I can't say too much about the food, it was a wide open area, with a collection of large, creepy "sun masks" hanging above the food. They were traditional Mexican art, but none of them had painted eyes (just holes) and all of them were staring at the customers. As a little kid, these things freaked me out. My sister also had a traumatic birthday here when she was young (with the "singing waitstaff surprise": you should never let a restaurant know it's your birthday, for children or adults). Needless to say, with both her and me traumatized by separate incidents, we never went here again, and it finally went out by the early 2000s or late 1990s. Around 2002, it was replaced with Los Cucos, a much classier Mexican restaurant, though Los Cucos ended up becoming notorious with a string of issues related to the Health Department. It's still open today, they cleaned up their act. I most recently ate here about a year ago, and I didn't get sick. In the 1980s, the space had been carved between two tenants. 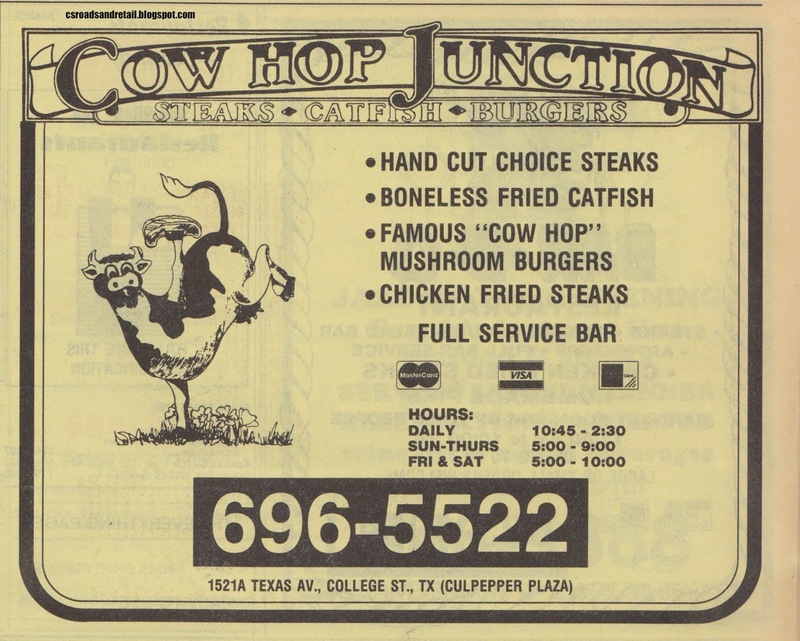 One of them was Cow Hop Junction, a spin-off of the Northgate establishment. Not sure what the other one was, but the 1980 directory lists "Little Mexico" for this tenant. 1601 - Home of Rosewood Junction in 1980, this was Mama's Pizza in 1989 (relocated from what is now Torchy's). 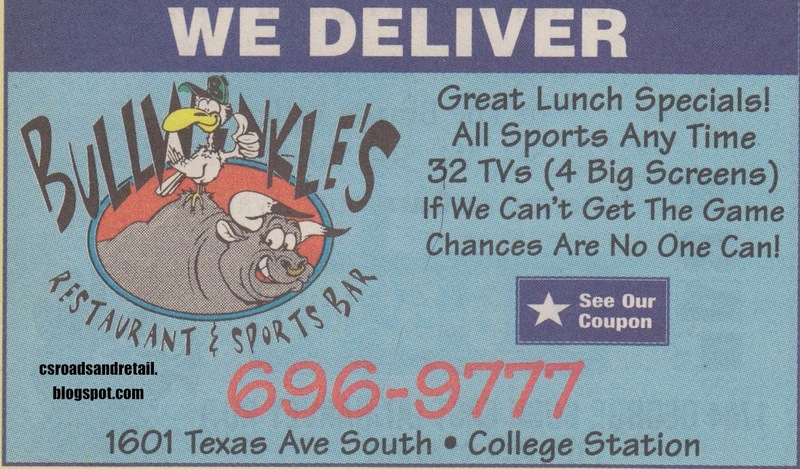 By the late 1990s, this was Bullwinkle's. 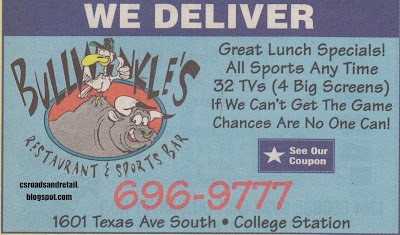 Bullwinkle's Grill & Bar was located at the very end of Culpepper Plaza, closest to Dominik Road. It's still talked about on MyBCS sometimes. Later home to Margarita Rocks (a seafood restaurant, in fact), which closed August 2009 (according to Yelp), it was replaced by Katsuya, a Japanese restaurant opened in late 2010 or early 2011 at the end of the strip (lots of vacancies). 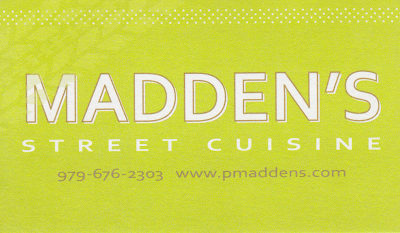 It had a short life: it got good reviews, but it had a kitchen fire soon after and did not reopen. The sign was soon taken down after about a year. It's since been reoccupied but it's no longer a restaurant: TITLE Boxing Club is the name of the game and does all the boxing you can't do at the UPS store. 1607 - 1980 directory lists this as "That Place II". I think it was some sort of hair salon. Today it is a salon as well...Apex Salon and Cuttery. 1611 - H&R Block was here in the mid-1990s and still here (there's mostly vacancies in this stretch, have been here for years). Interestingly, 1609 is also listed for H&R Block, so I really don't know which they do inhabit. Serendipity Shop was here in 1980. 1613 - From early 2012 to early 2015 this was Grateful Dog Self-Serve Dog Wash. Despite constantly advertising on TexAgs, I was not sold on the idea of a dog wash place--with all the effort it takes to load a filthy dog into your car and pay someone for use with presumably hoses and soap, why not just use your hose at home? The place officially closed because the owners were moving back to Dallas (if I read correctly) but I may have a theory on the REAL reason it closed...it just wasn't enough to make ends meet. Two years later the space was reopened as Sweet Horse, a "dessert café" with rolled ice cream and bubble tea. Historically, this was once part of (store space-wise) Lewis Shoe Store back in the 1980s (even in 1980). I don't have information on what it was prior to that, I know that it was one of the many vacant stores on that end of the shopping center. 1617 - In the mid-1990s, home to U.S. Black Belt Academy. No info found on the current tenant today. 1619 - Current home to Coach's Liquor. A comment below mentions that this used to be at Highland and Jersey (later George Bush), which I do remember it being there. I always wondered why there was a liquor store when Spec's was down the way. 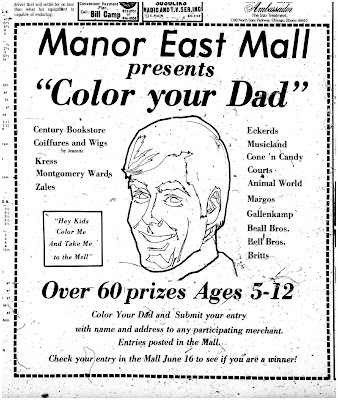 This was Lippman Music prior to 1994 and in 1980 was "Animal World Too" (spin-off of a long-standing Manor East Mall store, which eventually held out onto the very end). Yelp! mentions that the store closed in December 2014 rather abruptly for reasons unknown, and despite the dubiousness of that particular user, the closure is corroborated by the 2015 Google Street View, which shows the note (illegible) and decaying interior (signs fallen down, no open sign, etc.) In October 2017 it reopened as Honolulu Poke House. 1623 - Douglas Jewelry in 1980 and "Triple Crown Sports" in 1996. This was vacant for a while in the revived Central Station but it later became Breezesmokes (styled as breezEsmokes, but whatever), which opened early 2014 or late 2013 (to my knowledge). As of January 2016, it's now Signature Eyebrow Threading (apparently store #4) with no sign of Breezesmokes in that space. It seems like they retreated back to their Waco location (home base). 1625 - American Passenger Travel Agency in 1980 and Linder's High Tech Health in 1996. 1627 - Sandy's Shoes in 1980. 1629 - Aggieland T Shirts in 1980. Seems to be unrelated to current Aggieland Outfitters. 1631 - Originally Hastings (at least back to 1980), which moved circa '98 to the corner of Holleman and Texas Avenue (where it died in 2015). Much of the space it was in is now occupied by P.O.E.T.S. Billiards. 1635 - "No Return" in 1980, which is not the name of a store, but it implies that there was something there once. 1637 - Modern day spot of P.O.E.T.S. Billiards, a pool hall. This survived the renovation. I think it came in around the late 1990s, because my 1993 directory does not list it. 1641 - Wyatt's Sporting Goods in 1980 and "Rick's Sporting Goods" in 1996. Today, the space is still intact, but vacant. It's possible that this was larger in 1996 and not a small storefront like today. 1643 - Painting with a Twist is here today, a "paint-n-sip" studio. In 1980 it was Brazos Valley World of Books Shoppe. 1659 - This was Anna's Linens from the time of the Central Station redevelopment. It takes up half of the old Weiner's. In June 2015, Anna's Linens went the way of Weiner's and closed. It is now Wally's Party Factory as of summer 2016. 1661 - Weiner's from at least 1980 to at least 1996. It was a clothing store. The address and half of the space is taken by Dollar Tree today. 1663 - "Kids Mart" in '96. Modern day location of Cato Fashions. 1665 - Starship Hallmark Shop (a Hallmark store, no relation to Starships & Dragons, it seems) in 1996. 1667 - My 1996 directory scan lists University Book Store Inc., Sew Vac City, and Douglas Jewelers all in one place. Strange considering that the Sanborn Fire Insurance map and the modern day location of Brazos Running Co. shows it isn't very large at all. It used to be Shala's, which closed in 1985. Click for a larger picture, it is pretty small. 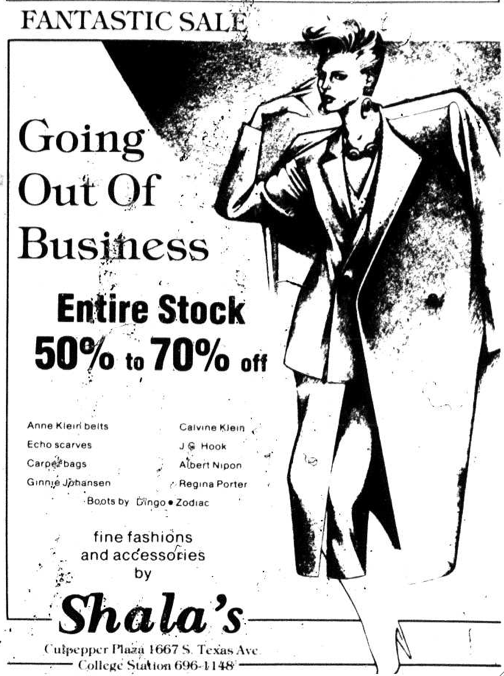 This is one of those 1980s clothing stores that went out of business in October 1985. I'm guessing that it died early from the oil bust fallout. The 1980 directory complicates this by listing Starship Hallmark as 1667 and "A A A House of Curtis Mathes" as 1667b. 1669 - Radio Shack in 1980. Later moved. 1671 - Cato Fashions in 1996, which is still around in a different place. The image above is from a picture pre-redevelopment. In the early 1990s (it closed by '96), it was Colberts. As you can see by the image below, Colberts had some rather outlandish women's clothing. This space was razed for Kohl's. In 1980 it was "Rush R & Co"
1673 - Radio Shack was here. It closed shortly before the space was torn down for Kohl's. I remember driving here circa 2006 to look for something related to a school project only to find nothing. 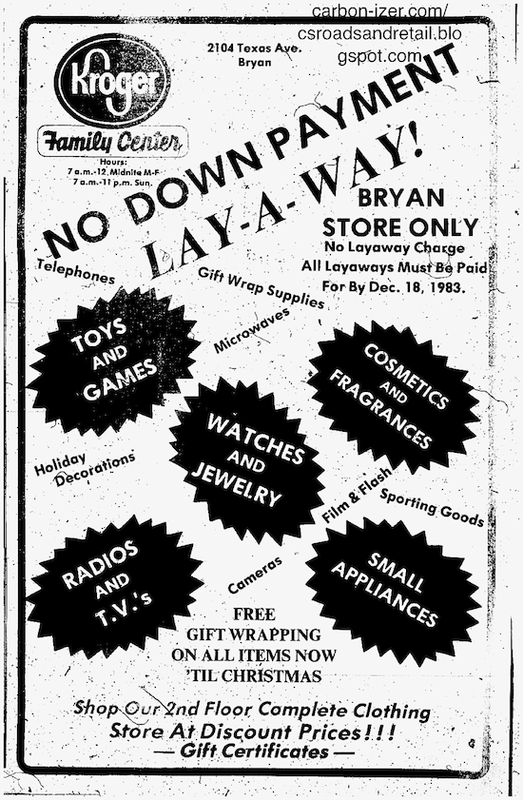 We ended up going to the mall, which until around the time when ol' RadioShack went bankrupt had one (there's still one in Bryan). In 1980 this was Roseanne's. 1701 - Address of modern day Kohl's. 1703 - One of the shops torn down in the redevelopment, this was The Curiosity Shop in 1980, Career Apparel in 1996 (listed as 1702, that can't be right), and by 1998 Bruegger's Bagels. When it closed, we didn't have a bagel shop anymore. We still really don't. 1705 - "Floppy Joe's Software Store" in 1996. I don't remember this AT ALL, but the comments do. In 1980 it was Top Drawer Pant Company. 1707 - "Right Price" in 1996 and "Regan's Dept. Store" in 1980. Demo'd for Kohl's. 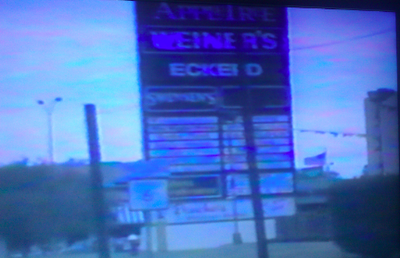 1709 - Eckerd Drugs was an original tenant, lasting from 1976 to at least 1996. Demo'd as well, but it had moved out for some time prior to that. 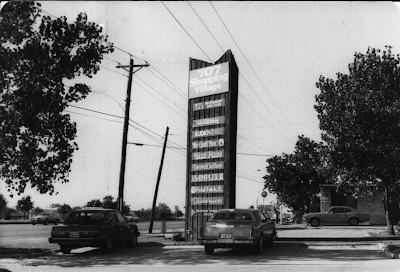 While I'm not sure if Safeway (later AppleTree) had its own pharmacy (it certainly had the space for it), Eckerd was often co-located with the Houston division Safeway stores, sometimes next door. I'm pretty sure that Eckerd did move to 2411 Texas Avenue in 1999, which makes sense chronologically (especially if it recycled its store number, which on the newer store was #382). 1711 - Payless ShoeSource, but died when it was evicted for Kohl's. See the image above (where Cato Fashions was discussed). In 1980, this was the home of Carnaby Square, a women's clothing shop. 1713 - This space has flip-flopped between restaurant use and non-restaurant use. In 1980 it was Trudi's Restaurant (as per the directory) and the spot of Clothestime (in 1996), though this was a CiCi's Pizza in the late 1990s and early 2000s. Post-redevelopment, it was HobbyTown USA (relocated from the Best Buy/Barnes & Noble shopping center) until it closed in January 2016. In June 2016, Nothing Bundt Cakes replaced it. 1717 - FX Video Game Exchange today. 1725 - Originally also encompassing the modern 1729, this opened as the city's third Safeway supermarket in 1976 and becoming AppleTree in 1989 when Safeway spun off the Houston division. It was my parent's supermarket when they moved into town, but I don't have anything but the vaguest recollections. The AppleTree survived for far longer than the rest of the Houston-based chain of almost 100 stores, as it was one of only six that survived after the company sold off most of its stores in 1993, and it only closed in November 2002 following the opening of the H-E-B down the street, especially since H-E-B trumped it in every category: it was newer, cheaper, larger, nicer, more upscale, et cetera and it was the third to last to close. After it closed, it remained vacant, was extensively renovated on the same footprint when the center was redeveloped (it likely reuses the foundation), and even then the address wasn't re-used until 2012 when OfficeMax moved into the side that Spec's didn't use. 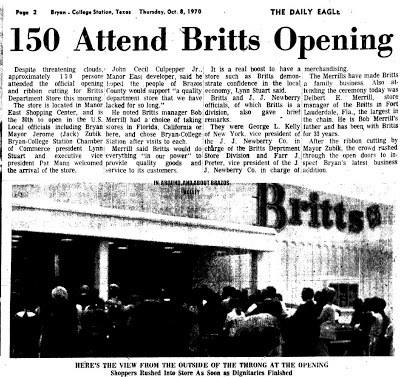 To note, this was one of the largest Safeway stores in Texas when it opened. The OfficeMax, store #6501 is currently going out of business as of this writing, presumably so the company can consolidate with the Office Depot down the street. 1727 - Napa Flats Wood-Fired Kitchen. This used to be Souper Salad for the longest time. This isn't part of the main strip, this is directly behind the Exxon. Before that, it was 3-C Barbecue. 1729 - Spec's Wine, Spirits, and Finer Foods takes up of the old AppleTree and is a newly badged address. This opened in about 2007.